Disappointed Alfreton Town boss Chris Moyses said his patched-up side was conceding too many goals after a six-goal thriller at Bradford Park Avenue. The Reds, with five enforced changes through suspension and injury, twice led in atrocious conditions before conceding a late equaliser to draw 3-3. Moyses said: “We are a little bit gutted to be honest. “We thought we had done enough to win the game. We have scored three goals and not won again — we are shipping a few, which is a concern. “We would have taken a point (before the game). We knew we were going to be in for a battle, so l would have said it would be a decent result. “We defended a little bit too deep, which didn’t get us up the field enough. Alfreton, still fighting to avoid relegation from National League North, fell behind rather easily on 15 minutes when defender Matt Hill overlapped to slide Danny Boshell’s through-ball past keeper Viktor Johansson. Heavy rain made an already soggy pitch extremely difficult to defend on, but the Reds were level by the half-hour thanks to a superb strike from Tom Platt, who latched on to a loose ball before firing home from 20 yards. Wwith six minutes of the first half remaining Chris Sharp turned on the edge of the area and shot past home keeper Ed Hall from a James Baxendale cross to give the Reds an interval advantage. Oli Johnson brought Bradford level in the 62nd minute with a simple back post header from a deep Mark Ross cross, but Alfreton edged ahead again ten minutes later thanks to an inspired substitution. 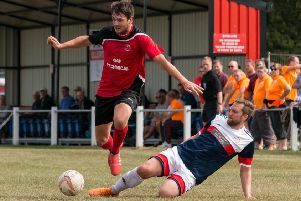 Brendon Daniels had been rested for the game, but when a free-kick was awarded just outside the area the dead-ball specialist was summoned into action — and with his first touch floated the ball off the defensive wall and beyond Hall’s reach. The home side pressed, but seemed to have been held at arm’s length until Boshell managed to prod a Johnson cross past Johansson with just two minutes left. Asked about the debut performance of Elliot Green, Moyses added: “l thought he did well. Injured keeper Chris Elliott was named on the bench and Moyses said: “He is coming on well. ALFRETON: Johansson; Topliss, Green, Wagner, Allan, Platt, Jennings (Daniels 71) Baxendale (Disley 76), Marshall, Sharp, Bell (Westcarr 68).